Enter to win an Omnatura Horn Bangle- go to the GiveAway Bandit FaceBook page to enter now! Click on the Flash Giveaway tab and fill out the rafflecopter form! Ends Saturday July 31st, 2011 at 12:01 am EST! 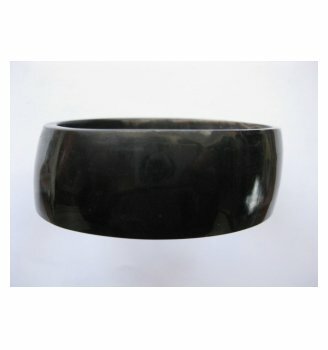 Horn Bangle -is a hand crafted bangle by Omnatura. This very fashionable horn bangle is hand crafted from reclaimed materials in collaboration with an artisan in the slums of Salvador, Brasil. It combines fashion and a good cause! The design is classic yet modern. The Omnatura line was created by Vivica Menegaz, a graduate of the Pasadena Art Center and collaboration with designer/artisan Selma Santos. Vivica mission was to create a collection combining modern design and aesthetic with traditional craft to produce sustainable fashion objects. Omnatura was born in Salvador de Bahia, Brazil. This collection draws it inspiration from the intricate Bahian culture. Combining African and European roots, the Bahia culture has a powerful nature making everything it produces beautiful. Omnatura supports the craftwork of local artisans in Salvador’ favelas (slums) making each piece a pure original piece of art. By supporting the products and services of young people, each piece is hand crafted with love and is composed of 100% natural ingredients.